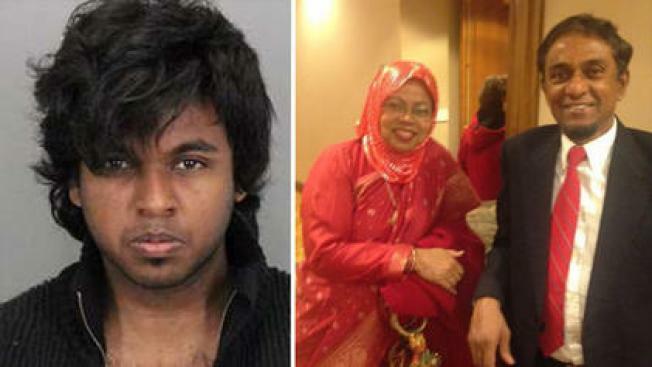 Hasib Bin Golamrabbi, 22, is accused of killing his parents 59-year-old Golam Rabbi and 57-year-old Shamima Rabbi. Hasib Golamrabbi's brother, 17-year-old Omar Golamrabbi, has been cleared due to "insufficient evidence." A 17-year-old boy has been cleared of a murder charge in the deaths of his parents at their San Jose home in April, the Santa Clara County District Attorney's Office said Friday. Omar Golamrabbi and his older brother, 22-year-old Hasib Bin Golamrabbi, were accused of fatally shooting their parents at their Evergreen neighborhood home on April 23, prosecutors said. Their parents, 59-year-old Golam Rabbi and 57-year-old Shamima Rabbi, were found deceased at their home in the 300 block of Lucas Court the next day by concerned relatives, according to prosecutors. "Our ongoing investigation determined that there was insufficient evidence to proceed against Omar Golamrabbi," district attorney's officials said. Omar had appeared this afternoon at the Hall of Justice in San Jose before Superior Court Judge Sharon Chatman, who dismissed the case, his attorney Sajid Khan said. "It was unexpected. We learned of this decision this morning," Khan said. Khan had been representing Omar with attorney Jessica Delgado, also of the Alternate Defender's Office. "Omar was nothing more than a witness to this case," Khan said. The attorneys had been preparing to present their arguments in defense of Omar on Monday at his preliminary examination, Khan said. "We are thankful to Deputy District Attorney Matt Braker for examining the evidence in this case with an open mind and for exercising his discretion to dismiss," the attorneys said in a statement. "We are also thankful to Santa Clara County Juvenile Hall Staff and the Santa Clara County Juvenile Probation Department for their care and concern for Omar over the past several weeks," the attorneys said. The 17-year-old boy will be released today from Santa Clara County Juvenile Hall into the custody of his social worker, who will decide whether he will be placed with relatives or other supportive guardians, Khan said. The 17-year-old boy plans to focus on completing high school and furthering his education, Khan said. The brothers gave conflicting accounts of their parents' deaths to police. Hasib Golamrabbi claimed he was assaulted at the home by a stranger who forced him to fire a gun at his father, but didn't see his mother get shot, according to a statement filed in court by San Jose police Sgt. Patrick Guire. Omar told investigators that his older brother shot their parents and didn't say anything about a stranger at the home, Guire said. Hasib Bin Golamrabbi's next court appearance is scheduled for July 13, according to online county jail records.